These terms of service cover all aspects of this website, and you must make sure that you have through completely. 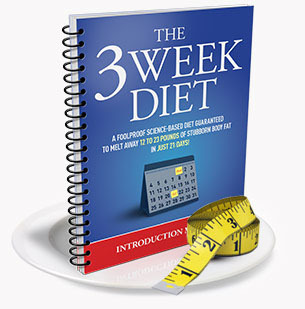 The Three Week Diet will further be known as TWD wants you to know what happens when you use the website. Each part of the service terms includes how you are given services and how your experience will be framed on the website. The site is a place that helps TWD collect information about potential clients, and the information that is collected is used to be sure that everyone is given exactly what they want. Secure connections on the site will protect all your information, and you will find out how much information is collected when you enter it yourself. We only receive what you give us, and you are accepting the mailed package once you enter your address. We do not use your address for anything else, and we store your client information in a secure server that you will be happy with. The site is so much easier to use because we are only asking for very small pieces of information so that you will get what you need without any trouble. TWD is a diet plan that you ahve to stick to exactly. All results vary because every person is of a different size and shape. You might have a disease or other disorder that makes it hard for you to get the results that you think you need. We cannot guarantee that you will get the results that you thought you would get when you started, and we also want you to know that you need to make sure that you have consulted with a doctor and followed the plan as close as you can. We cannot create all the perfect results for you just because you got the book. The book was designed to be a point of action, and you must take action when you receive it in the mail. Our claims are based on the tests that we have done with people who have wanted to use the TWD to get better results. We know that you are not like the people that we tested, but we have done our homework before the site began. You can contact us at any time for advice, but we are not your doctor or nutritionist. We cannot offer advice that is bound by any law, and we cannot offer you any advice that would be considered confidential. We reserve the right to track our clients using cookies, and we have an integrated ad plan that uses that information if you have not disavowed cookies. Please remember that we are all involved in a larger marketing plan, and you may receive information or ads from other companies that might find you interesting. This is all part of our overall marketing package, and you need to eliminate cookies if you have problems. Our company mission is to make sure that you have every chance you can to lose weight and feel your best. You can make a life change that we want to help with, and that is why we have set up this site. We have these rules and policies in place so that you will have the best experience possible, and you can contact us at any time if you want to know something more about our company and how we provide the best results. You have a right to leave our website if you do not agree to our terms of service, and we will note that duly if you have any concerns about your experience. Signing onto our site is an agreement of these terms of service, and you must choose to leave the site if you feel that you do not agree. We will give you the best experience that we can, but you have every right to go somewhere else if you object to how we manage our business or our website when sending you the free eBook.